Not using your car that much? Rent it out! You probably only use your car for one hour a day — so why not rent it out for the other 23 hours? The typical car owner is behind the wheel for less than an hour a day. Considering the cost of the typical vehicle — around $34,000 — why not let it work as hard as you do? That’s the idea behind Maven, the car-sharing subsidiary of General Motors. We’ve entered the “sharing economy,” with Americans renting out their homes and using ride-sharing services when they travel. Maven wants to let owners of late-model GM vehicles profit from this trend by renting out their personal vehicles when they’d otherwise be parked. 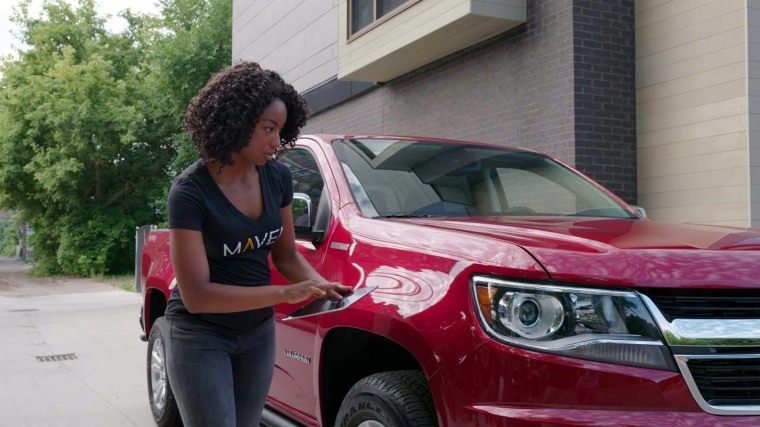 Maven already offers its 150,000 registered users the ability to make short-term rentals of GM vehicles using a smartphone app. The new program will supplement the corporate fleet with personally owned Buick, Cadillac, Chevrolet, or GMC products, as long as they’re from the 2015 model-year or newer. The service will use the OnStar telematics system GM builds into all its new U.S. models to make it easy for an owner to give access to a customer looking to rent their vehicle. Maven also will provide a $1 million insurance policy to cover the vehicle and reduce owner worries. And its software system is designed to vet renters to ensure they’re qualified. Participants will set their own price, with guidance from Maven. No money will directly change hands, either, as Maven will handle rentals using its smartphone app and then transfer payment to the vehicle owner’s own account. The car-sharing service estimates that an owner of a vehicle like the Chevy Equinox SUV could make as much as $500 a month if it’s rented out for at least part of every day — more than enough to cover the monthly payment and gas. A Chevy Equinox owner could make as much as $500 a month if it’s rented out for at least part of every day. The peer-to-peer project is being launched in three cities: Detroit, GM’s home; the nearby college town of Ann Arbor; and Chicago. If it’s deemed a success, GM plans to expand to other markets starting later this year. GM actually won’t be the first to offer peer-to-peer car rentals. The pioneer is San Francisco-based Turo, which was originally known as RelayRides when it was launched in Boston in 2010. As of the end of 2017, the service claimed to have had 4 million registered users with access to 170,000 privately owned vehicles. Turo now operates in Canada and the United Kingdom, as well as the U.S. Meanwhile, PSA, the French parent of the Peugeot and Citroen brands, launched its own car-sharing program at LAX, the Los Angeles airport. Initially, it is relying on travelers who want discount parking and a share of the fees for letting their vehicles be rented out while they’re gone. Eventually, however, the company will start adding some of its own products to the rental fleet as part of a phased-in return to the U.S. market it abandoned one-quarter of a century ago. Car-sharing is one of the many ways in which the automotive industry is trying to adapt to changing consumer demand. It’s still relatively small compared to ride-sharing, however, with companies such as Lyft and Uber serving millions of Americans on a regular basis. Meanwhile, Google spin-off Waymo plans to roll out a nationwide ride-sharing service using self-driving vehicles that will debut in Phoenix later this year. Even the way consumers acquire their vehicles is changing. A number of manufacturers are introducing new “subscription” programs that include virtually all costs, including taxes, fees, and insurance. Some of these programs allow a motorist to swap between different models by the same manufacturer. Others permit a subscriber to cancel out with a week’s notice. What’s clear, analysts say, is that the way people move around is changing rapidly. A recent study by the Boston Consulting Group estimated ride-sharing alone will account for as much as one-quarter of the miles Americans travel by car by 2030.